Elizabeth A. Povinelli. 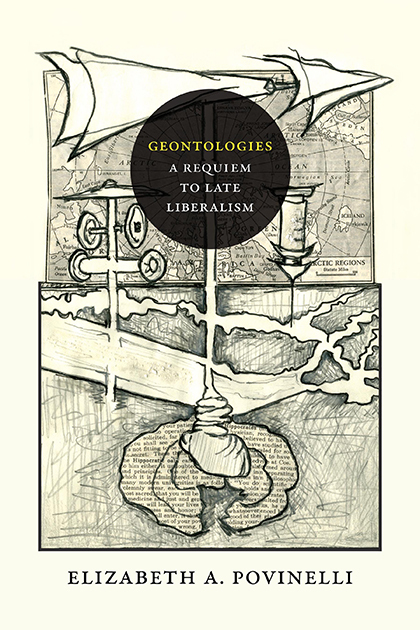 Geontologies: A Requiem to Late Liberalism. Durham, N.C.: Duke University Press, 2016. 232 pp. In Geontologies: A Requiem to Late Liberalism, the anthropologist and critical theorist Elizabeth A. Povinelli recounts a 2013 lawsuit opposing the Aboriginal Areas Protection Authority to OM Manganese Ltd., a subsidiary of the mining multinational OM Holdings Ltd. The corporation was found guilty of deliberately damaging Two Women Sitting Down, an indigenous sacred site, at the Bootu Creek manganese mine in far North Australia. OM Manganese, the claimant argued, had gone after the blood of two dreamlike ancestors, a bandicoot and a rat. Two Women Sitting Down, a rock formation composed of bleeding figures, constitutes a set of almost too on-the-nose protagonists for the Anthropocene—the geological era in which human intervention has left indelible traces. Given that the formation was anthropomorphized and zoomorphized, rather than human or animal, the company’s action was prosecuted as desecration instead of manslaughter, attempted murder, or murder. The unlikely legal victory, Povinelli explains, uncovers the dynamic of a late liberal artifact termed geontopower. To be sovereign under geontopower is to adjudicate the distinction between life and nonlife as the fundamental ground of late liberalism’s governance of difference and markets. According to Povinelli, the court decision did not unsettle this distinction, as it rendered the indigenous narrative as a traditional cultural belief, not an analytic of contemporary existence. Indigenous people were invited into the realm of sovereignty only on the condition that they refrained from challenging the ontological integrity of life and nonlife. Yet, as Povinelli argues throughout Geontopower, the distinction between life and nonlife that “the sovereign people of geontopower” regulate is eroding (p. 35). Povinelli sketches this erosion in settler late liberalism with the help of a cast of “tools, symptoms, figures, and diagnostics”: the desert, the animist, and the virus (p. 16). The desert and its associated carbon imaginary capture the affect that motivates the search for instances of life in milieus hostile to it. The animist and the imaginary of the indigene eliminate the difference between life and nonlife by imbuing all existents—Povinelli’s preferred genus for animate and inanimate individuals—with vital life force. The virus and its terrorist imaginary, for their part, radicalize the desert and animist; the virus extends itself by rearranging the energies of the carbon and indigene imaginaries. Geontologies is not the taxonomical project for which its opening chapter, “The Three Figures of Geontology,” prepares the reader. Povinelli does not in fact sequence the figures and their imaginaries, but periodically appeals to them in case studies and theoretical reflections. Povinelli’s main theoretical intervention situates geontopower as a mode of governance that has long subtended—and now enfolds—biopower. Whereas biopower operates through the governance of life and the tactics of death, geontopower aggregates discourses, affects, and tactics that configure the relation between life and nonlife. The term geontopower is thus a shorthand for what might most accurately be labeled bio-geo-onto-power: power derived from the ontologization of life and nonlife. Povinelli’s revision of Michel Foucault’s biopolitical paradigm is clarifying. So is each of the vignettes in which Povinelli engages with other social ontology A-listers: Giorgio Agamben, Alain Badiou, Gilles Deleuze, Graham Harman, Quentin Meillassoux, and Jacques Rancière. Povinelli’s argument seesaws—on purpose, by all indications. In addition to theoretical debates pertaining to ontological abstractions, the author develops contemporary analytics proper to the Karrabing Indigenous Corporation, an alternative social project that values an improvisational relation to late liberal geontology above state forms of land tenure and group recognition. Even though a chasm exists, and widens as the book progresses, between the overwhelmingly Western and male company of critical theorists and the indigenous insight that the author seeks to highlight, Povinelli’s odd pairing has the advantage of deforming the reader’s expectation that ethnography should be an immutable source of evidence for critical theory. The combination resists synthesis. After insisting that “Nonlife is what holds, or should hold for us, the more radical potential,” for “Nonlife created what it is radically not, Life, and will in time fold this extension of itself into itself,” Povinelli leaves the reader with an imperative: “Cling to life even in the form of its mass extinction” (pp. 176, 177). The author instructs us to hold on to lowercase-i life in its migration from life to nonlife—a migration heralded by these poles’ growing instability. Povinelli’s conclusion speculates a reverse-desert/animist/virus of sorts: not a promise of life in nonlife, not an elevation of nonlife to the rank of life, not an exchange of qualities between life and nonlife, but the embrace of nonlife as life’s final destination. History’s death drive is unstoppable. Sing a requiem, say a prayer.